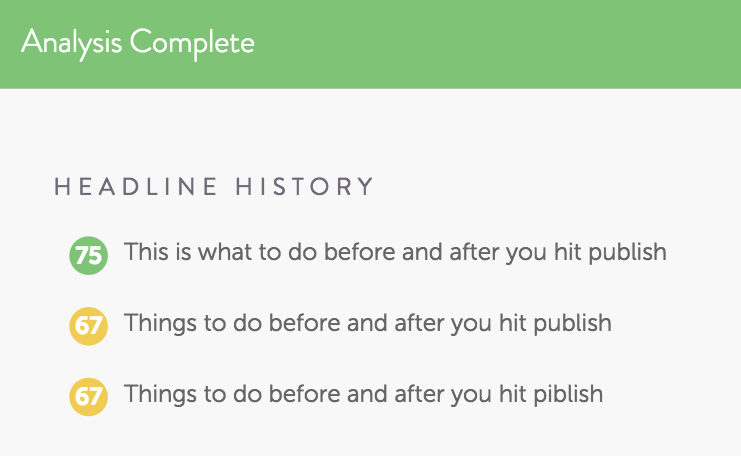 Before you make your content public, you need to take steps to finalize each of your blog posts. For optimal engagement, your posts have to be perfect. Here’s how you can make that happen. CoSchedule’s headline analyzer will help you determine how “clickable” your headline is based on the word-count and word balance. AMI’s headline analyzer is going to tell you the emotional value (EMV) of your headline. 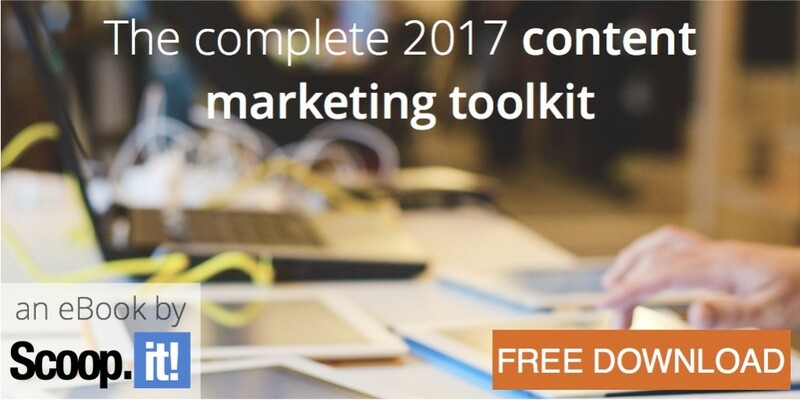 If you’re targeting a particular demographic, this analysis will come in handy. Aim for an EMV score of 45% or higher. Your headline and valuable content are now complete. But, have you double-checked to ensure that everything makes sense? What about removing wordy phrases, cliches, and passive voice? You need to. Grammarly can help you quickly proofread and edit for standard errors. The tool will check for repeated words, overused words, passive voice, sentence fragments, and more. Essay Tigers is the last resort. If you’ve written a dozen articles and have zero time to edit and proofread them, you can employ these guys to do it for you. At the end of every post, let your readers know what to do next. A strong call to action (CTA) directs website traffic to exactly where you want them to go. Are you building a contact list? Ask readers to subscribe to your newsletter. Do you want viewers to see an older piece of content? Ask them to follow a link. Once your post is optimized for engagement, and you’ve hit the publish button, you’re ready for the next part. Now, you’re going to generate traffic and build some links. Here’s what to do after your article goes live. Responding to blog comments isn’t something you want to automate. Your readers will appreciate the fact that you take the time to have a conversation. Communication with readers helps build trust and relationships. Respond directly on the blog page (not via email or social media). Reply yourself (don’t have someone else do it for you). Be thoughtful and keep the conversation going. Don’t spam comments with your products and services. Share outstanding comments on social media. All blogs need a social media strategy. Once your post goes live, it’s time to share. Set up social media automation to take the work out of this step. Dlivr.it will help you set up an RSS feed connecting your blog to all of your social media profiles. You can choose the frequency and time of posts based on the best times for your various social media audiences. You’ll want to share your post more than once. The frequency of social media shares depends on the audience and the platform. It’s considered best practice to share on Twitter many times, for example, where repetitive Facebook posts can become spammy. Canva is a helpful tool for creating images to upload with future blog post shares. Each image should be different to add variety to your posts. Hootsuite works well for scheduling future social media posts via Facebook, G+, LinkedIn, Twitter, and more. Tailwind will make scheduling Pinterest pins a breeze. Upload your images with unique descriptions, then choose on which board to share. An automatically-generated schedule makes pinning super simple. 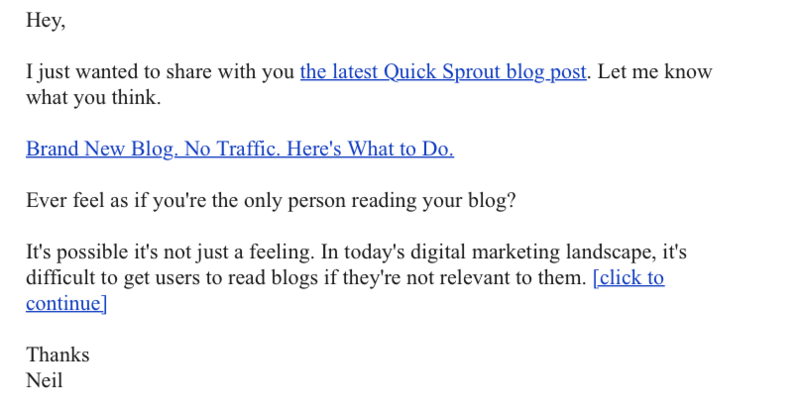 The people in your email list already like your blog and the topics you write about. That’s why it’s a good idea to let them see your post first. You’ll have about ten comments before you even start promoting! How about that? Keep your email sweet and simple, just like Neil Patel does. Here’s a newsletter I usually get from him about a new blog post. Neil just says he’d like to share a new blog post with his readers and asks for a feedback. He also includes a quick intro to give a feel what the blog post will be about. Notice how Neil places three links to the article in his newsletter, and, yet, it doesn’t look spammy. Don’t forget why you’ve written a new blog post in the first place — to drive more traffic and build some links. So now it’s time to promote like crazy! You have probably featured someone else’s work in your article. Could’ve been research, case studies, practical examples, etc, – something that made your post more trustworthy. So why not reach out to a blogger whose research you featured to thank them? AND mention that they can feel free to share your article if they want to. Not everybody will share, but you’ll still get a couple links and social media mentions. Aggregator sites allow you to submit links that are then voted on and actively discussed. Reddit is a good example of an aggregator site. Find an active, relevant subreddit with high traffic and publish a link to your post there. Reddit receives 150 millions pageviews each month. So why not get a couple thousand for yourself? Some bloggers like to create weekly or monthly roundups — lists of links to resources, articles, and tools they find useful. What happens if they lack just a couple links for this week roundup? That’s where you come in and offer your article. Getting into a link roundup is a great way to generate more traffic to your site. Following the steps above will help you take your blogging beyond just good writing and help you generate more traffic, engagement, and conversions. 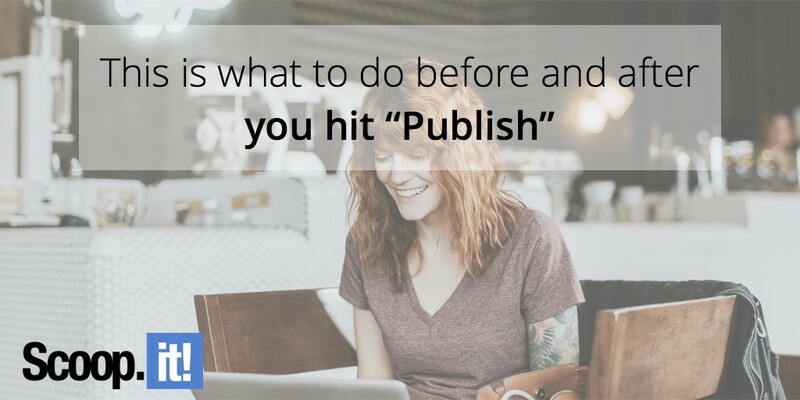 Before you publish, check your headline, edit your post, and include an engaging CTA. After you post, share on social media, schedule future shares, join the discussion in the comments, and perform outreach to build links. Try these tips with your next blog post and come back here to discuss how they worked for you. Stacey Wonder is a freelance writer and editor who likes to reading, biking, and writing on her blog - Tenacious Pen.